Curated by artist collective Aisle 4, the politically engaged original works can be found in bars across Toronto this week. If you're having a drink at a bar in Toronto this week, don't forget to look under the glass. 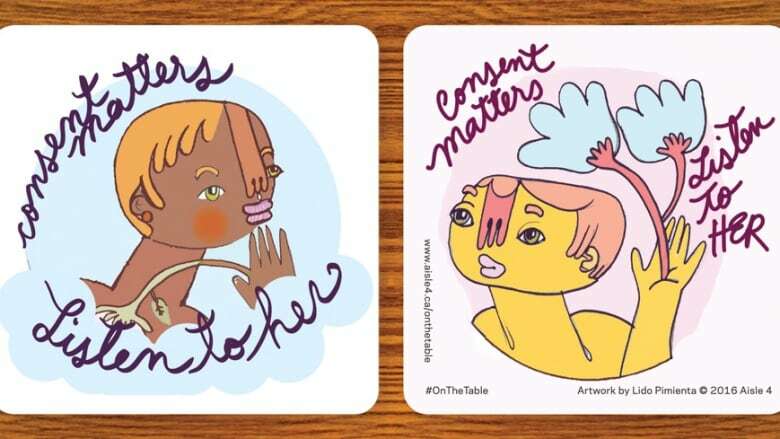 There's a good chance your coaster won't have the familiar beer logo you'd expect, but instead the work of one of four local artists who are aiming to ignite dialogue around gender-based violence and sexual harassment at bars. On The Table is a series of artist-designed coasters that will be distributed to bars across Toronto from January 16 to 22 as part of the Toronto Design Offsite Festival (TO DO). The vision of curatorial collective Aisle 4, the politically engaged original works feature the designs of Jesse Harris, Aisha Sasha John, Hazel Meyer and Lido Pimienta — who were each asked to respond to the correlation between alcohol consumption and gender-based violence. "On The Table utilizes design as a form of activism to demonstrate how public art and social practice can have long-lasting and meaningful impacts on a variety of communities," Shannon Linde, a member of Aisle 4, tells CBC Arts. "These coasters function as artist multiples: patrons are encouraged to take them home, potentially extending the conversation to a wider audience." For Linde and her colleagues at Aisle 4, the project continues their mission to initiate and promote socially engaged artworks through collaborations with artists from a range of disciplines. Last spring, the collective worked with nine different artists to reflect on the impending redevelopment of Toronto's Galleria Shopping Centre. The exhibit — staged inside the mall itself — worked as a love letter to the Galleria, which has served as a community hub since it was constructed as one of the city's first enclosed malls in 1972. With On The Table, the curators have expanded across the city (a full list of participating bars can be found here). The designs you'll find under your drinks at those establishments will emphasize "the importance of being an ally, practicing consent, utilizing social empathy and trusting your intuition," according to Linde. "The coasters' messaging is direct, accessible and powerful. Each, in its own way, empowers audiences to carry out an action that promotes safe spaces." Aisle 4 initially sought to target men in their twenties and early thirties with the project, but the designs that ended up on the coasters speak to a much wider audience that that. "In the case of Aisha Sasha John's coaster ('Trust your gut'), her primary audience is women," Linde explains. "Jesse Harris' piece ('Men Are All Lies / Men Are Allies') is very much targeted at men. We hope the coasters reach all patrons and staff in licensed establishments, and potentially further in other environments depending on where they are displayed or shared. These issues negatively impact everyone, not just women, and the onus is on all of us to speak up against harassment and violence." Linde also hopes the project simply gets people talking — because the more these issues become a part of the conversation, the more likely things are to change. "There's something about dialogue amongst friends and peers over a beer that seems like the perfect avenue to share different perspectives and discuss difficult topics," she says.